I’ve seen no absolute proof that the James Manning who assaulted young Jake Stofer on the streets of Lovewell in 1899 was Thomas Lovewell’s most recent son-in-law, though it’s hard to imagine that he was some other James Manning who just happened to be in the area. It was a fairly common name. 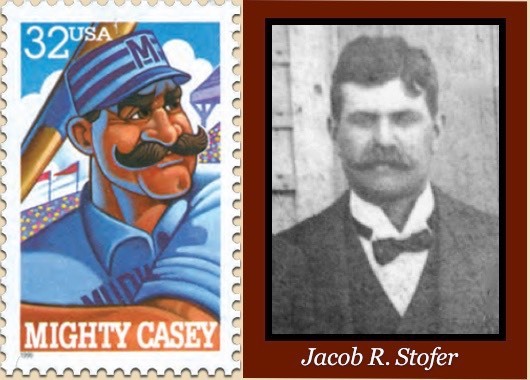 Anyone casting a net for it in late-19th-century historical records will quickly discover a former professional baseball player who was the owner and manager of the Kansas City Blues the same year that Jacob Stofer crumpled to the ground after Manning lofted a brick at his head. Although the culprit was surely no ball player, his victim certainly looked like one. A photo of Jacob taken a year before the assault, depicts a burly man who closely resembles cartoon likenesses of the subject of Ernest Lawrence Thayer’s familiar poem “Casey at the Bat,” someone you might consider subduing with a brick before taking him on mano a mano. After softening up his opponent by hurling a chunk of masonry, Manning immediately pounced and began pummeling Stofer’s face with his fists, breaking his nose and causing many lesser injuries before scurrying away. Charges were quickly filed and a telegram went out alerting lawmen in neighboring counties to arrest James Manning for attempted murder. A newspaper story about the incident revealed that bad blood that had existed between the two men for some time, and that Stofer had recently ordered Manning out of his house (see “Hits and Missus”). A detail describing the incident as having occurred “about train time in Lovewell” probably suggests how the culprit was thought to have made his escape. He did not remain at large forever, as a story in the July 9, 1900, edition of the Topeka State Journal reveals. James Manning Wanted in Jewell County For Attempted Murder. The sheriff of Jewell county came to Topeka today and secured a requisition upon the governor of Colorado for the return to Kansas of James Manning, wanted in Jewell county for attempting to murder a man. Manning is now under arrest in Colorado, but at what point the sheriff declines to state. The sheriff left at noon today to bring the prisoner back to Kansas. Instead of "a couple of years" Manning had been on the lam for only sixteen months, and his whereabouts must have been known by many in Republic County and neighboring Jewell County. Exactly one month before coshing his sworn enemy with a brick, James Manning had married 15-year-old Diantha Desdimona Lovewell, and his new bride apparently joined him in Colorado, where their daughter Mary was born in 1900. The fact that Manning was now a father, or would be one very soon, may have helped him escape punishment. There was also the matter of T. C. Smith to take into account, another Lovewell son-in-law who had been released from Lansing only a year before Stofer’s beating, after serving a term for embezzlement. Dropping the charge against Manning would spare the family further embarrassment. Besides, Jake Stofer’s bumps and bruises had healed long before his assailant was hauled back to face justice, and Stofer himself was about to wed a Scandia girl, putting him in a forgiving mood. Perhaps it was enough that Manning never again showed his face in the region. Whenever Diantha Manning made one her occasional trips to visit family and friends in Kansas, she would come alone, local papers always mentioning the fact that she was returning to her husband, now living or working in Pennsylvania, Chicago, or Wyoming. The family got around. There must have been rumors about the state of her marriage or the possibility of her husband’s incarceration in 1905 and 1906 when Diantha spent the whole winter with her parents at Lovewell. After the birth of their son William in Pennsylvania in 1912, James quietly exits the family story* leaving behind five children but no photographs. Thus, he never shows his face in the family history, either. *Diantha was reportedly ready to join her husband in Wyoming in 1915 after spending the winter with her parents at Lovewell. Though both would lives out their days in Wyoming, they would remain apart.